Scientists at Johannes Gutenberg University Mainz (JGU) and the University of Erlangen-Nuremberg are working on a heat engine that consists of just a single ion. Such a nano-heat engine could be far more efficient than, for example, a car engine or a coal-fired power plant. A usual heat engine transforms heat into utilizable mechanical energy with the corresponding efficiency of an Otto engine amounting to only about 25 percent, for instance. The proposed nano-heat engine consisting of a single calcium ion would be much more efficient. The main aim of the research being conducted is to better understand how thermodynamics works on very small scales. A pilot prototype of such a single-ion heat engine is currently being constructed at Mainz University. As the physicists explain in an article recently published in the journal Physical Review Letters, the efficiency of heat engines powered by thermal heat reservoirs is determined by the second law of thermodynamics, one of the fundamental concepts in physics. It was as far back as 1824 that Frenchman Nicolas Carnot calculated the maximum possible efficiency limit of such engines, now known as the Carnot limit. In the case of the newly proposed nano-heat engine, the scientists have been theoretically able to exceed the classic Carnot limit by manipulating the heat baths and exploiting nonequlibrium states. Calculations and simulations made about a year ago showed for the first time that the thermo-dynamic flow in an internal combustion engine could be reproduced using individual ions. The idea was to use a calcium 40 ion, which has a diameter a million times smaller than that of a human hair, for this purpose. 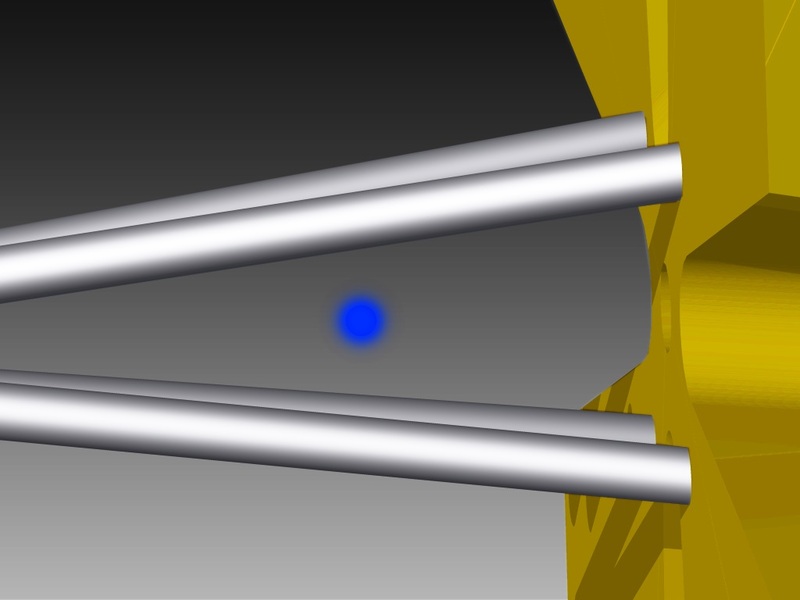 "Individual ions can basically act as the piston and drive shaft or, in other words, represent the entire engine," explained Johannes Roßnagel of the Quantum, Atomic, and Neutron Physics (QUANTUM) work group of the JGU Institute of Physics. Individual ions have already been captured in Paul traps and, using laser beams and electrical fields, not only cooled and heated but also compressed. "This means we are able to manipulate the pulse location distribution for optimum efficiency," added Roßnagel. "Exceeding the Carnot limit for a standard heat engine thus does not violate the second law of thermodynamics but instead demonstrates that the use of specially prepared, non-thermal heat reservoirs also makes it possible to further improve efficiency." In their publication, the physicists calculated the general Carnot limit for this situation. As the mechanical capacity of a single-ion machine is extremely low, it can probably only be used in heating or cooling nano systems. The intention is now to actually develop the proposed single-ion heat engine in initial experiments and construct a prototype in the laboratory. 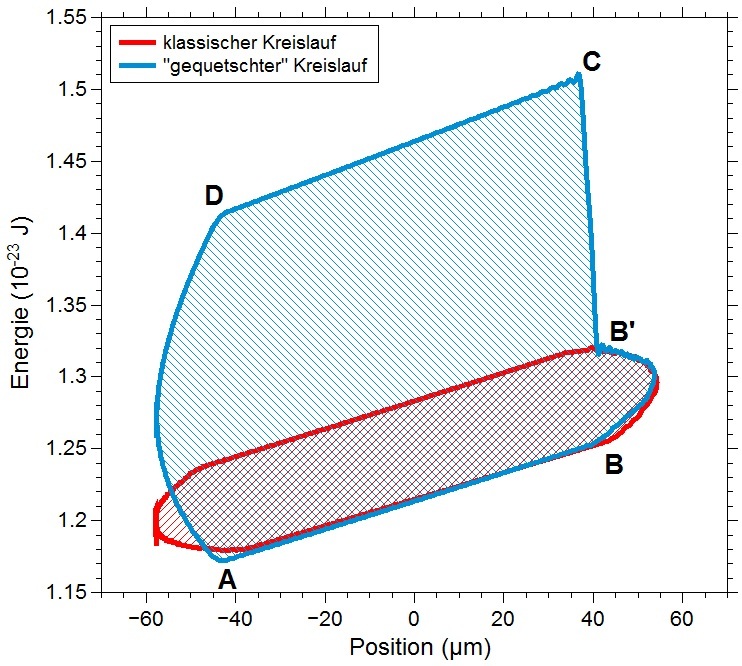 Simulation of an Otto cycle of a single-ion heat engine: the enclosed area pictures the produced work that is significantly increased by way of squeezing. 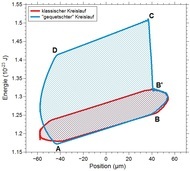 A single trapped ion in a linear Paul trap with special geometry: The heat engine is being realized by the divergent bars; the squeezing is being caused by establishing special electrical fields.